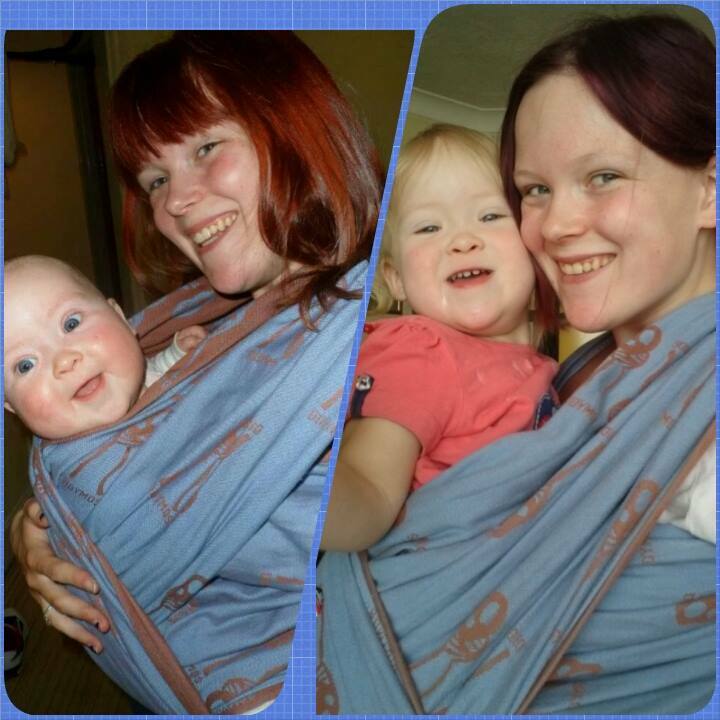 mumma93 | My journey into Babywearing. A little introduction to me…. I was excited to test this wrap as it is a brand that I wasn’t overly familiar with. 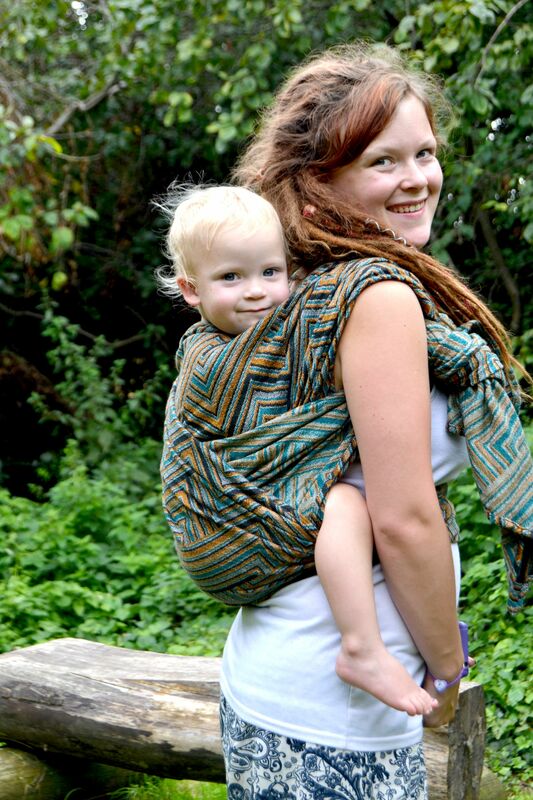 The wrap is 100% cotton, size 4, with a Jaquard weave and weighs in at around 260 g/qm. When I opened the packaging, I was surprised to see the bag the wrap came in. Unlike most other wraps I have had the pleasure of using, which have a cotton bag; this wrap came packaged in a fantastic waterproof bag which would be brilliant if you were going out in wet weather, or taking it camping. The first impressions I got of Ayiri Sea Island were that the colours were absolutely stunning. 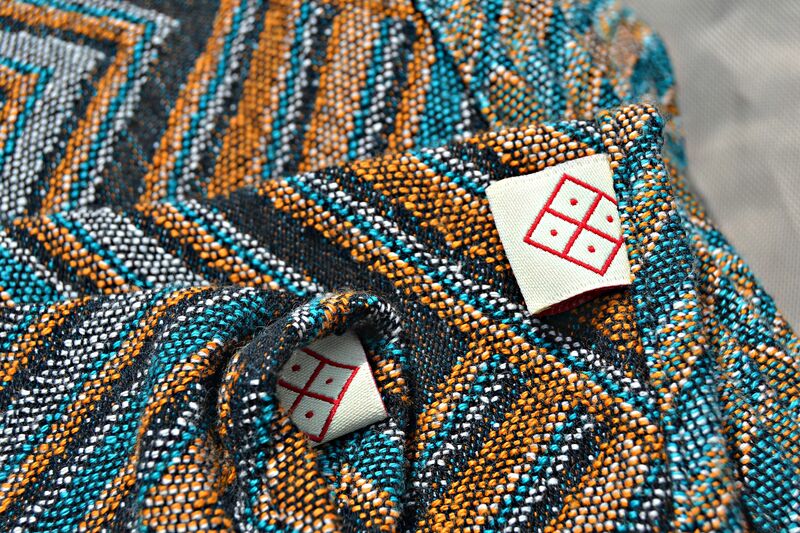 The combinations of gold, shades of teal and black woven in an eye-catching geometric pattern, not only make it a beautifully fitting wrap for Autumn, but also lend a wonderful 3D effect when wrapped. 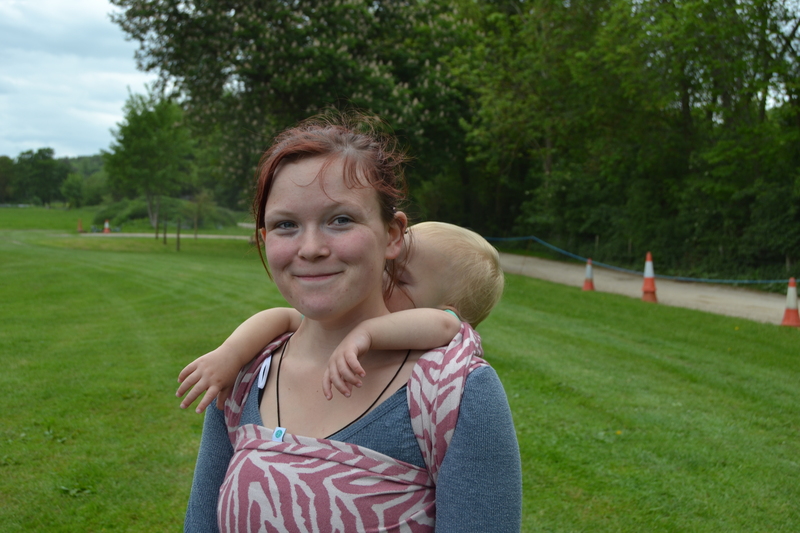 I used this wrap to do a Double Hammock, Giselles Back Carry and a Robins Hip Carry so I got a good idea of how the wrap worked for back carries, and one shouldered carries. To touch; the wrap doesn’t feel overly soft, however I can imagine that after a bit of use it would become beautifully broken in. This means that tieing with tippy tails is a bit fiddly so ring finishes do come in handy. 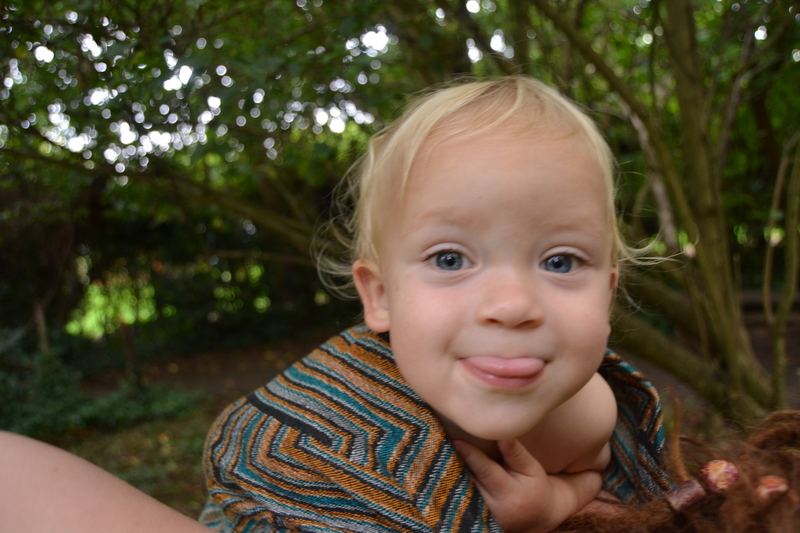 However, once wrapped, this wrap is unbelievably supportive and would quite happily hold my toddler for hours. The wrap also has a good amount of grip to it, which makes it great for double hammocks as it doesn’t overly matter if there’s some slack in the chest pass. I also found that the 100% cotton blend meant that the wrap was brilliant for British weather as we didn’t get too hot and sticky when the sun came out. I also wouldn’t be overly worried about the wrap getting rained on as due to the cotton, it is not a wrap to be afraid of washing. 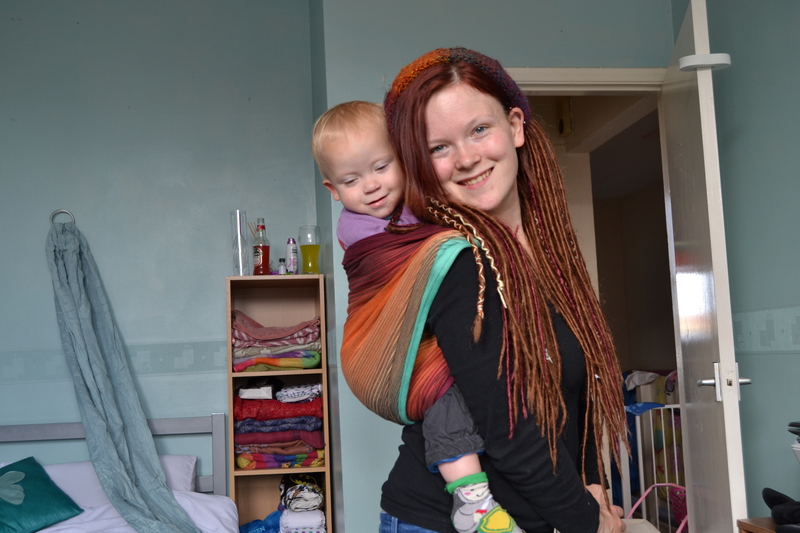 Over all this wrap is a fantastic addition to anyones stash; providing nice airy carries, stunning colours and plenty of grip. I would also say that this wrap is great for beginners; due to its blend, and the fact that it is easily washable. 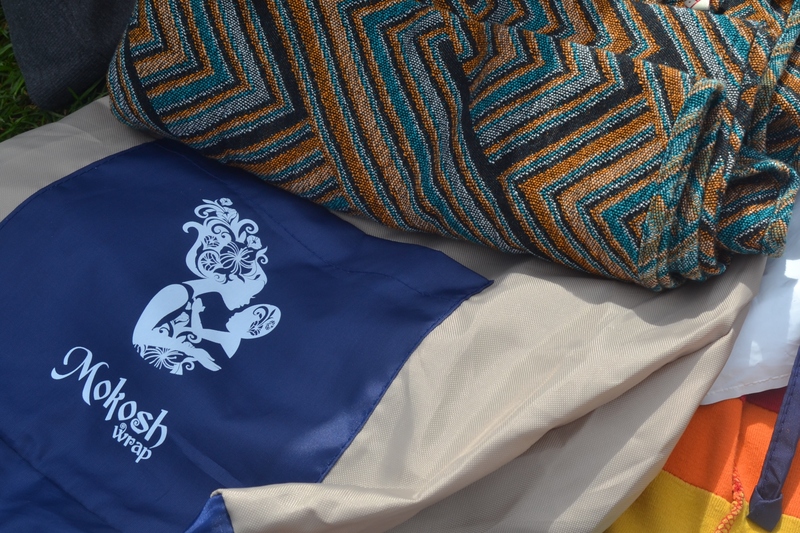 Mokosh originates in Russia and sales are generated through the Facebook page and Etsy store. New Video!!! Giselles Back Carry. This took me a few days to master….the video took what felt like a year to edit!!! But it was all worth it 🙂 This is a fantastic carry!!! Now that my youngest is getting bigger, and will soon be starting pre school; it has begun to dawn on me that he is rapidly gaining independence and turning in to a little boy rather than the tiny baby he used to be. He has gone from being almost permanently attached to me, to going off on his own without even looking back to see where I am. 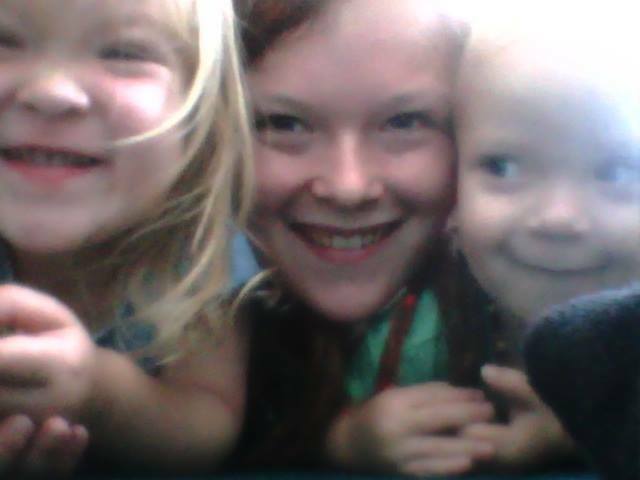 I think I suddenly realised when I went to Brighton last week without my babies for the whole day! This was the first child free day out I’d had since my eldest was born 3 years ago. Despite being massively excited about not having to lug around 50 million things, and being able to go in and out of places with ease; there was still a small part of me that was dreading leaving them both for so long (especially my youngest as he is still breastfed). I was worried that he would get upset and want his boobies…yes, they are no longer my body part – he owns them…. 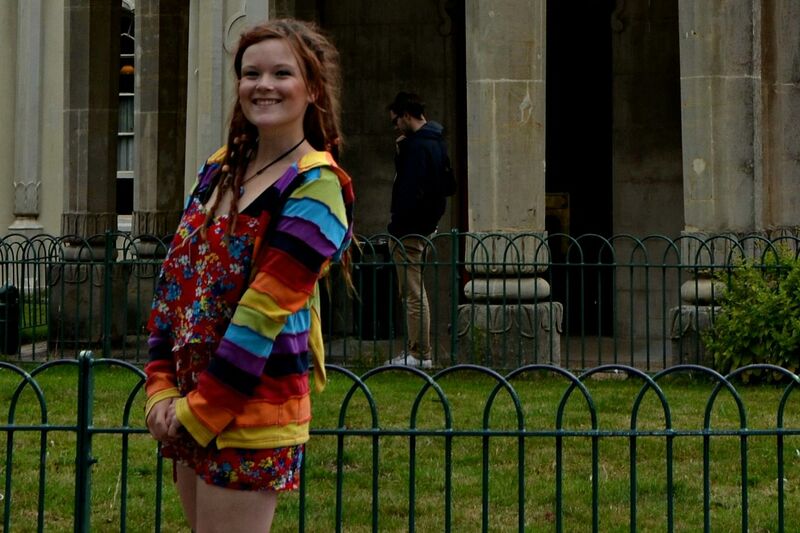 Despite my head continuously thinking of reason to not go, I went and had a fantastic time. Obviously the kids we’re constantly in my thoughts and by the end of the day I could not wait to get back to them. Part of me was expecting to come back to them upset from missing me all day, but they didn’t. Reflecting on how I felt then seems a little self-centered now – but in that moment I was over joyed to see them, as well as a tad sad that they hadn’t really missed me like I thought they would. This is when it dawned on me that my little people who needed me every second of every day weren’t babies any more, and that perhaps I am more dependent on them than they are on me! This whole scenario got me thinking about how much time I have left to enjoy those sleepy sling cuddles, and the process of wrapping my child to me. 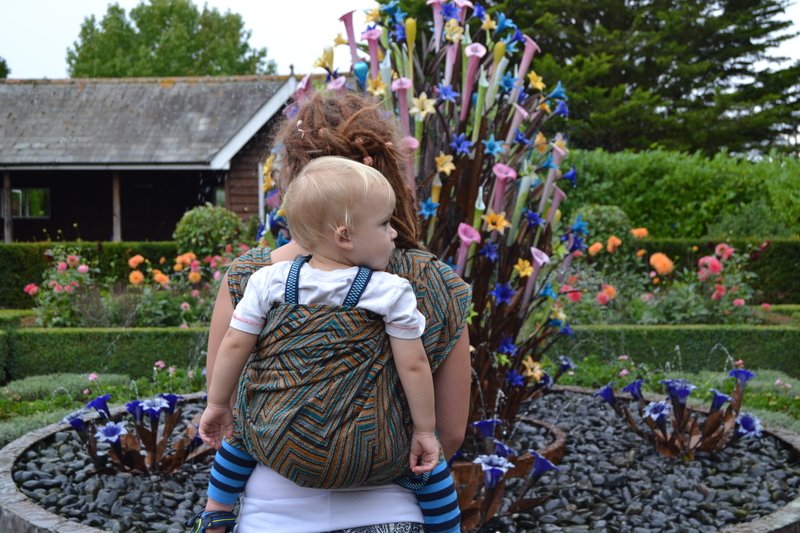 This seemed like such a pain in the beginning of my babywearing journey; but now that they’re older and are carried much less frequently, I take time over every single step to enjoy it. I love feeling the rush of oxytocin, and the absolute unbreakable bond between the three of us. 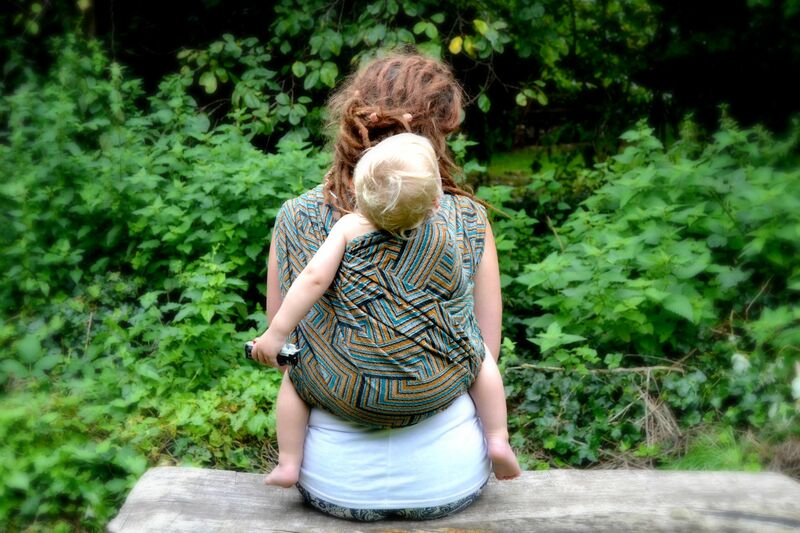 Not only has babywearing helped me to bond with the 2 people I love most in the world, the process of learning about this whole world itself has shaped my entire future. 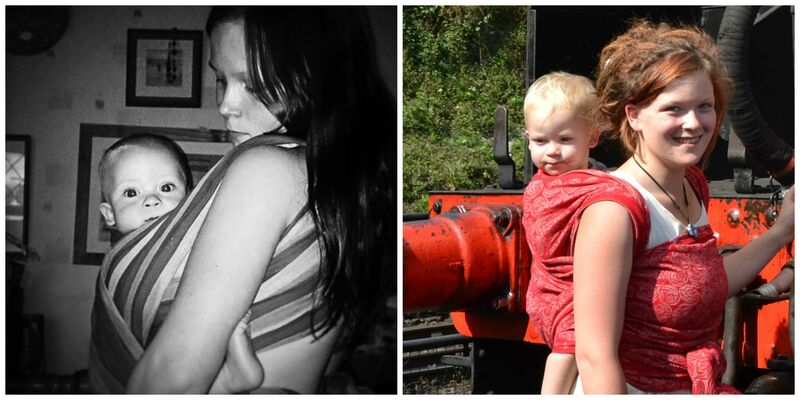 Since having the children, I have gone through some of the biggest emotional ups and downs (big, big downs) of my life. I have made new friends, and taken part in training that I never thought I would do. 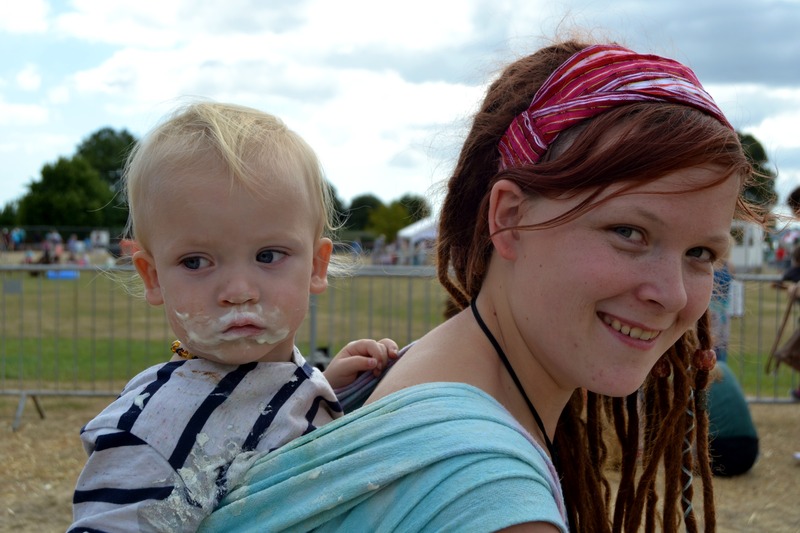 Four years ago I was halfway through applying to be in the Navy….If someone had said to me then that I’d soon be a mother, uni student, sling consultant, breastfeeding supporter and aspiring doula – I would have never believed them. A simple 4.6 metre long piece of woven cotton literally changed the way I look at life. 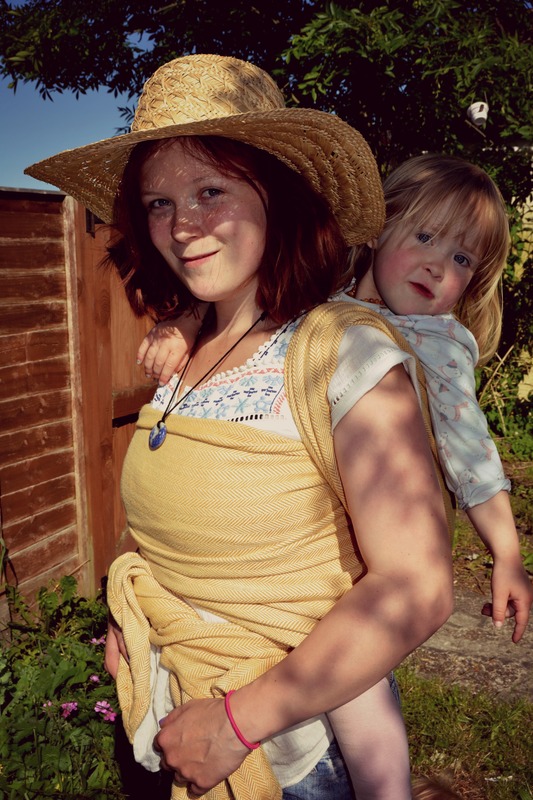 Of course having the children opened up a whole n ew world of parenting to me; but until I discovered babywearing, the first 4 months of my new parent life was being told what to do by people who thought they knew more about how to look after my daughter than I did…whether this be from a well-meaning family member, or an over bearing health professional. Carrying my daughter in a bit of fabric developed so much in me emotionally that I didn’t even realise until now. Learning how to wrap taught me patience and trust in my own instincts; it made me realise that there is way more out there than what parents are ‘spoon fed’ in books and media. One piece of fabric helped me to become strong! I feel there is a really strong symbolism in tying the knot in any carry I do with a woven wrap. I find it absolutely fascinating that such a simple thing is not only holding all of my baby’s weight and keeping them from harm; it is also causing so many microscopic biological explosions inside mine, and my babies bodies every second. 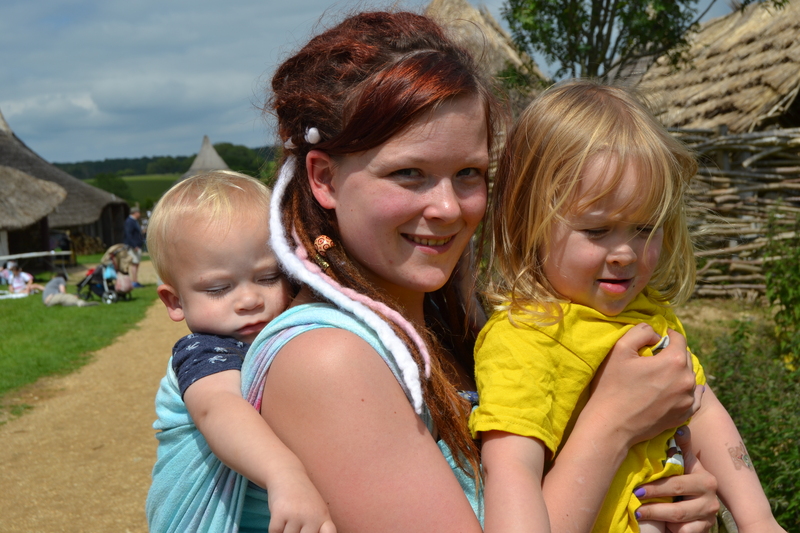 When my son was born, I had already got to grips with the basic carries…I knew how to do fwcc, ruck, dh and how to use a ring sling and mei tai, I also learned how to tandem wear. As well as being the main talking point in the group I went to at the Childrens Centre; This also allowed a fantastic bond to develop between the new big sister and her baby brother. I can remember my heart literally melting when I looked down to see they had both fallen asleep, but were holding hands. Even when I tandem them now they still hold each others hands. This bond has continued through the past 2 years (for 70% of the time), I have never seen 2 siblings protect each other like they do. My second pregnancy was emotionally awful, and the first few months after weren’t too great either. After going through a really crap relationship breakdown leading up to, and after having him; I felt really vulnerable to post natal depression. I hadn’t succeeded at breastfeeding my first, so was determined to do it this time. 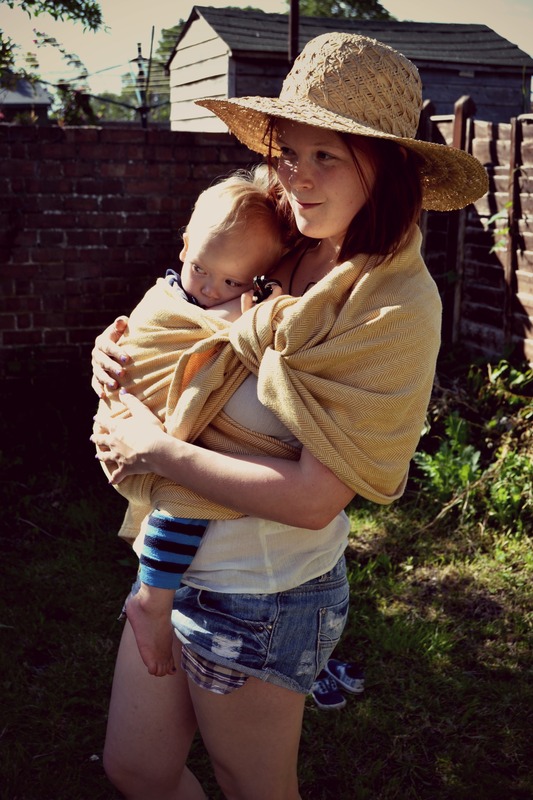 Again, because of a simple (yet slightly more expensive) piece of fabric, I was not only able to really commit to breastfeeding – I also felt that the closeness that was created when carrying him in a sling really helped get me through the first few months after his birth. So fast forward to now and what am I left with?? Well for a start I’m left with a crap tonne of awesome wraps, a bunch of amazing people who I’ve met along the way, an insane amount of experience and knowledge, a role in other parents lives who want to carry their babies, and most of all; two amazing little people whose bond with me has been shaped by the ability, confidence and trust in myself as a mother. Despite me feeling a bit sad that they don’t need me in the way they did when they were newborn; I am so happy that the attachment I have with them means that they can grow up knowing that I’ll always be there, and they can be confident in whatever they do. All of which came from one simple, cheap piece of fabric! So that’s why I carry my babies…. I will continue to carry them for as long as they want me to. The last 3 years have gone so fast! I want to enjoy the time that I have with them wanting cuddles from me for as long as possible. My wraps have been to lots of places so far this summer. The kids and I went to The Green Festival in Droxford which was amazing!!! So much to do there I could go on for days. Samba drumming, belly dancing, craft stalls, henna and building with natural materials to name but a few things we did. Roses Aphrodite was a fantastic wrap to take; my favourite wrap out of my collection. Artipoppe Russian Tyger came with us to West Sussex where we visited Singleton Open Air Museum. We made our own butter, tried bread and mead made the tudor way over an open fire (their dad thought it was like skyrim…). 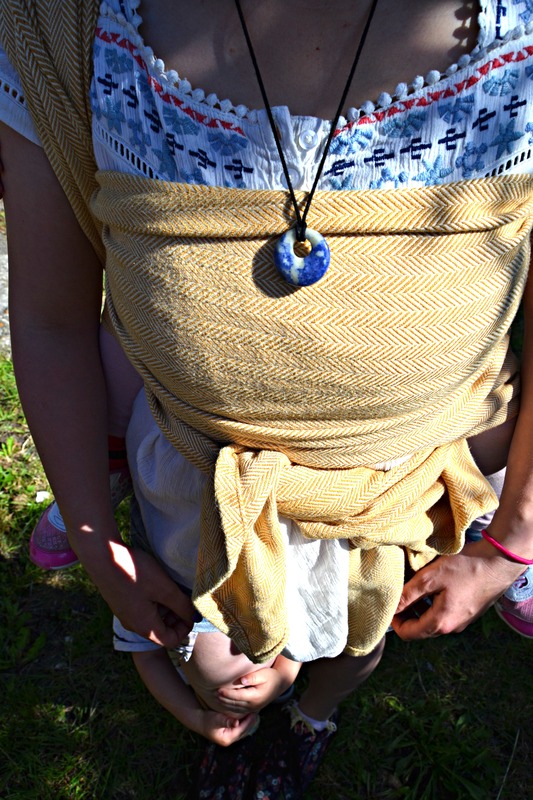 I took several carriers here – Tula, Didymos size 2 and my Artipoppe so I could chop and change depensing how how hot or cold it got, and how much the kiddies wanted to walk. 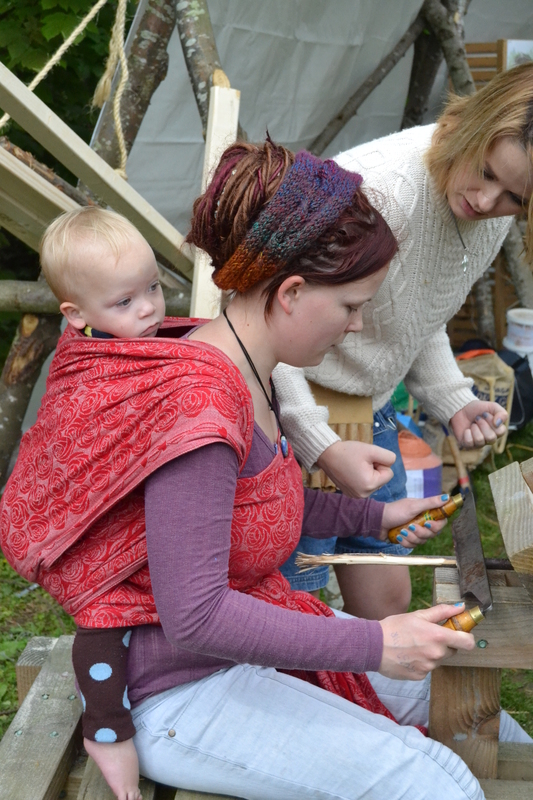 Then we went to a fairy festival in Butser Hill Ancient Farm. This was a very hot day so my nice thin indio was perfect to keep us both cool. The kids loved making fairy wands, flower head bands and seeing all the goats and sheep. Then me and the family went to the Sultan Show (a local show that the Royal Navy do). It’s a fantastic day out with stunt bikes, stunt horsemen, craft tents, steam engines and a funfair. 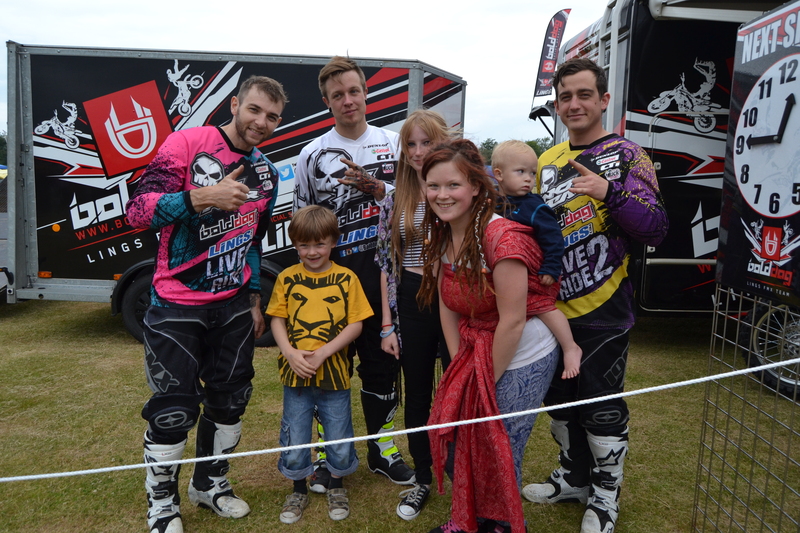 Here we are with the Bold Dog stunt bike team 🙂 Roses Aphrodite was yet again perfect for this day out. And finally, yesterday; we went to the woodland show at the Royal Victoria Country park in Southampton. The weather was lovely again so my indio was perfect. I also don’t mind this wrap getting ice cream on it haha. The kiddies rode on donkeys and saw birds of prey, and had a ride on a minature train. I can’t wait for all the things we’re gonna do in the summer holidays 🙂 keep checking back for more reviews, videos and updates soon! I felt very lucky to receive this wrap, and couldn’t wait to try it out! Herringbone Splendour finally arrived on Wednesday and I was pleasantly surprised to find it packed in a pretty little tote with the brand embroidered on the front. As the wrap is circulating the UK for people to test; it also came with a diary for all the testers to write in. I love this idea as it was brilliant to read what everyone else had found the wrap to be like, and the journeys others had made with it. It also blew my mind that TK Maxx in the US is called TJ Maxx!!! (haha). I first took the time to feel the fabric, hold the folded wrap in my hands and see how the wrap hung when I held it up. 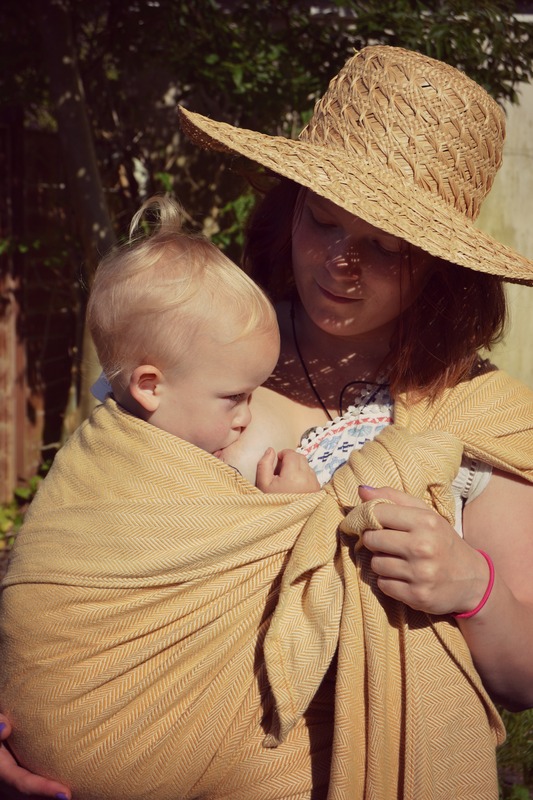 At first touch, this wrap feels beautifully soft and floppy, as well as feeling quite weighty and supportive for bigger babies. I wrapped with it as soon as I had finished studying it using the RRRR (Pirate Carry) (link to video page). The wrap is nicely grippy, and held w ell even in with a carry that was quite loose. Daniel certainly seemed to feel comfortable, and was extremely well supported. 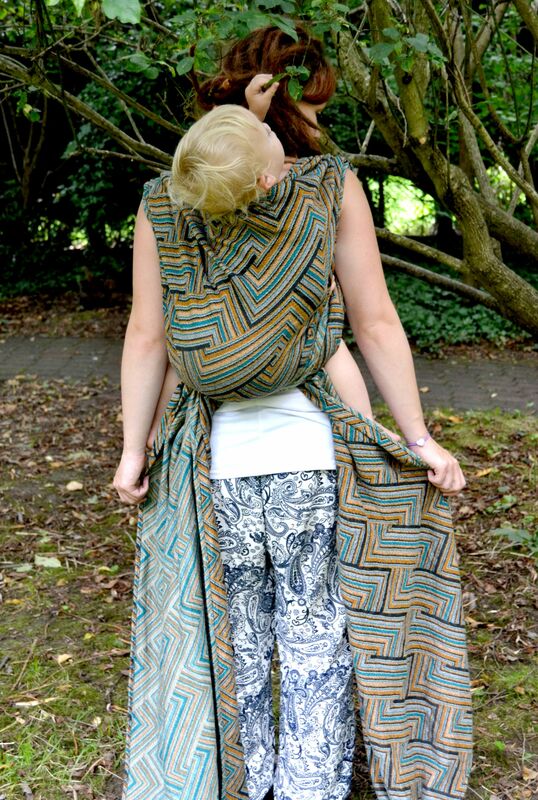 The grippiness, I assume, comes from the beautifully simple zig zag style pattern which is alike to a Didymos Lisca. 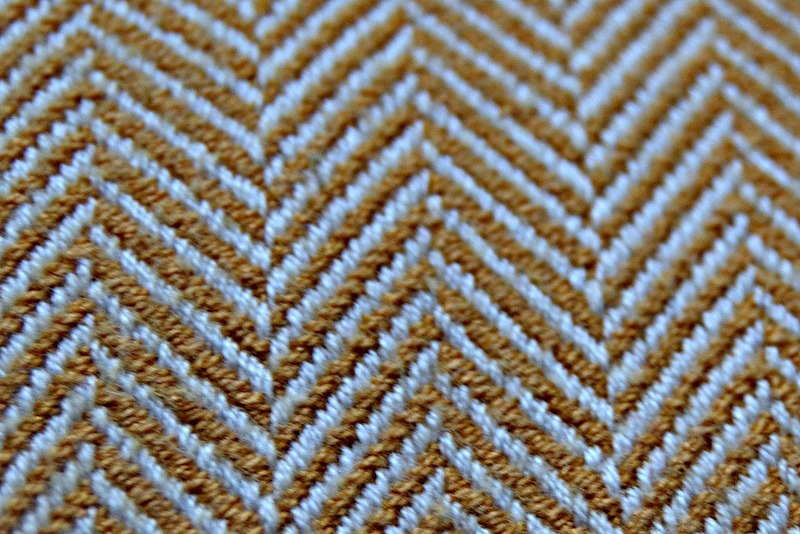 You can see from the image below how the 100% cotton wrap and 100% tencel weft work together. After a few hour s playing, I managed to wrap my chunky three-year old in it. We went with Double Hammock and the wrap still continued to hold extremely well, and was super cushy and supportive for her (she doesn’t get wrapped much now so this was a real treat for her!). The chest pass was easy to tighten as the wrap glides beautifully, making it brilliant for beginners. And with the shoulders sandwiched, her weight was no problem for my back or shoulders as thew wrap did its job of carrying her perfectly. I then did a semi front wrap cross carry with Daniel. Once again, the wrap held him well, and was no issue on just one shoulder. The colour of the wrap is perfect for the spring and summer as it just blends with all the beautiful colours of flowers. I love the colour of this wrap, but would also be excited to see poe release some bright colours that pop; and to also experience a more lightweight wrap of theirs for some comparison. I have owned a starry night before, and they are quite notorious for being extremely stiff when brought new, and take a while to break in. 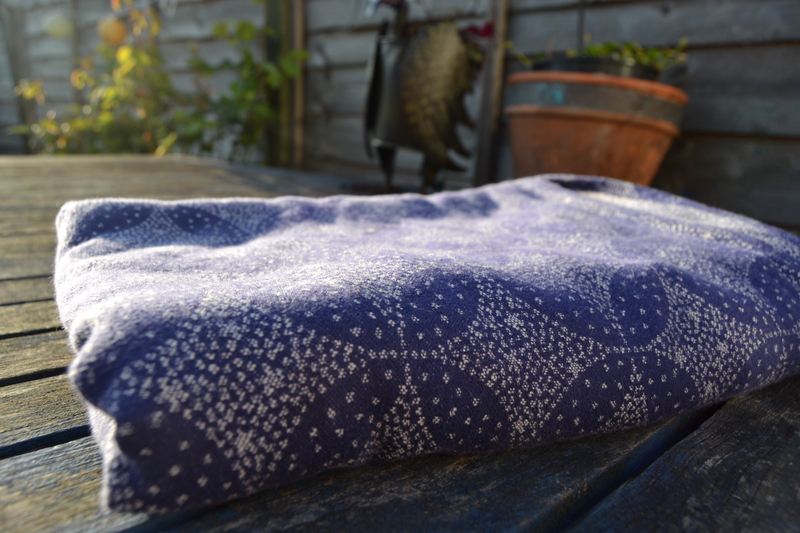 So I was relieved when this pre loved nebula arrived and was lovely and mouldable, soft and cushy! I could do any carry with it instantly, and didn’t have to worry about washing it or using rings or some other trick to soften it up. I also got a very good deal with this wrap, a size 4 for £80!! One of the reasons I love Oscha so much is because there really is something in their market for everyone. The wrap comes in 2 different versions which have different blends. I have the blend which contains 75% blue ecru cotton, and 25% wild silk. I can tell you that when well broken in, this is beautiful to wrap with, and from a distance looks almost shiny. The amazing geometry of the pattern makes me want to look deeper in to the wrap as you seem to be able to spot new things all the time. For example when looking at this, I first see repeating, perfectly shaped diamonds inside circles, then I see flower like shapes within the blue that have 4 petals, then I see the tiny little stars that are dotted about inside the diamonds. This pattern is truly fascinating. Although the colour may look silver from a distance, and have a beautiful shine, up close it is actually white and doesn’t shine, which surprises many. 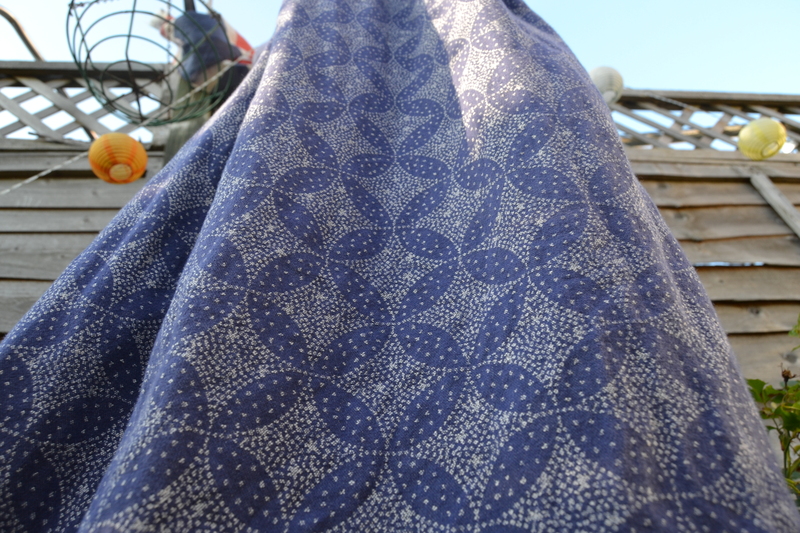 I must admit when I received SNN Raven I was surprised at first, but it doesn’t affect how much I love this wrap. This size 4 is the perfect shorty. It isn’t too heavy (240gsm), so is good for the rising temperatures and the un predictable British weather. Nebula is also extremely toddler worthy and supports not only my 18 month old, but my gigantic 3 year old as well (she really is massive!). This is refreshingly nice as she often gets a bit jealous is her little brother only gets to try the new wraps. With this length, I can just about manage to tie off a Double Hammock (i am size 8-10) so it is an extremely versatile size for me. In my opinion, this carry is the type of carry that once learned, makes every other carry seem just a little bit easier. The double hammock is super supportive and really wiggleproof which makes it an excellent carry for long walks or if you suffer from back pain. This carry also brings with it, a large number of variations and finishes which means you never get bored. A video of the variations and finishes you can do with a double hammock is coming soon! 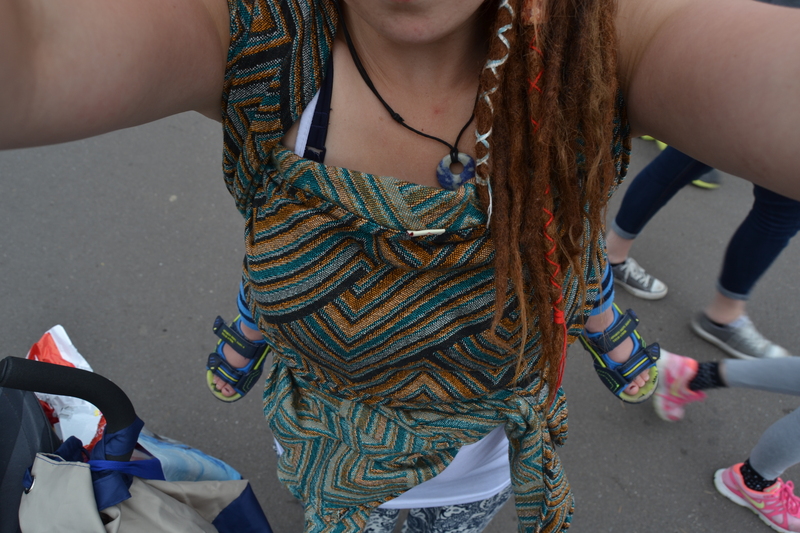 My first Oscha wrap…in loooovvee!